The V3 Convoy just may be the gaming desktop you've been waiting for--namely, one that sports an Ivy Bridge processor and a decent price. 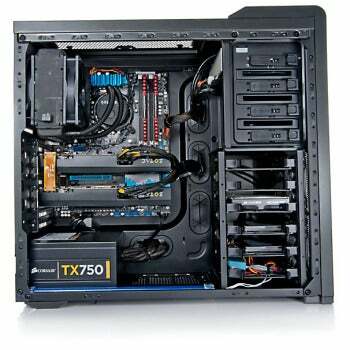 Other gaming-oriented performance desktops, such as the currently top-rated Maingear Shift Super Stock, carry Sandy Bridge Extreme Edition processors and impressively steep price tags, but the Convoy costs just under $2500 as configured (price as of June 19, 2012). Don't get me wrong--the Convoy doesn't have the frills that some gamers are looking for, and the price reflects that. For example, it has only 8GB of RAM instead of the usual 16GB, a Blu-ray reader/DVD writer in lieu of a BD-RW drive, a relatively plain black chassis, and static, unchanging LEDs. For the budget-minded gamer, however, the Convoy offers performance fairly close to that of the $8000 Shift Super Stock, just in a less glamorous case. Our review model, priced at $2499 as configured, came housed in a Corsair chassis with an Asetek sealed liquid cooling system. The Convoy includes a third-generation Intel Core i7-3770K processor, 8GB of RAM, and a 1TB Hitachi hard drive. Also featured are two Nvidia GeForce GTX 670 graphics cards in SLI, as well as two 64GB solid-state drives in RAID 0. The system runs the 64-bit version of Windows 7 Home Premium. In PCWorld's WorldBench 7 benchmark tests, the V3 Convoy earned a score of 193. This means that the V3 system was 93 percent faster than our reference testing model, which was no surprise since our reference system has only a second-generation Intel Core i5 processor. Scoring near the 200s is only just above average for the gaming PC category, though: Many tested gaming PCs, including the Maingear Shift Super Stock (205) and the Primordial Medusa (207), have broken the 200 mark. Still, 193 is a very good score, and this custom PC will no doubt handle all of your regular gaming needs. The Convoy is also 3D-ready, but you will have to supply your own glasses and transmitter. The Convoy performed well in our gaming-specific tests, too, with a gaming score of 87. This result is very good, even for the performance desktop category, and it puts the Convoy in the same league as the aforementioned Shift Super Stock (94) and Medusa (83). In our Crysis 2 graphics tests, the Convoy managed frame rates between 64.4 frames per second (maximum-quality settings, 2560-by-1600-pixel resolution) and 97.6 fps (low-quality graphics, 1024-by-768-pixel resolution). By comparison, the Shift Super Stock, which has three AMD Radeon HD 7970 graphics cards arrayed in triple-CrossFire, performed better at the maximum settings, reaching 80.2 fps versus the Convoy's 64.4 fps. In lower-quality situations--even at "high" quality settings with 2560-by-1600-pixel resolution--the Shift Super Stock and Convoy performed similarly well, both achieving frame rates of about 95 to 97 fps. 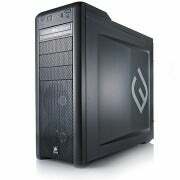 The V3 Convoy is housed in a large, black Corsair Carbide 400R tower. The case is rather attractive, considering that most towers are pretty indistinguishable; it has smooth black sides, a honeycomb mesh front, and rounded edges. The system is decked out with bright internal lighting, too, with blue areas (which you can see through the honeycomb mesh windows on the left side of the machine if you're facing the PC), and white areas (which you can see through the front mesh). A few convenience ports--two USB 3.0 ports, microphone and headphone jacks, and one FireWire port--sit on the front of the Convoy, along with the power button, reset button, and Blu-ray drive. Also present is a switch that allows you to turn the front white lights off. The rest of the ports are located on the back of the machine. On the motherboard, you'll find four additional USB 3.0 ports, two USB 2.0 ports, gigabit ethernet, a combination mouse/keyboard PS/2 port, DisplayPort, HDMI-out, S/PDIF-out, DVI-out, VGA-out, and support for 7.1 surround sound. Each of the two graphics cards has two DVI-out ports, one HDMI-out port, and one DisplayPort connection. Opening the Convoy is easy, thanks to the toolless case. The left panel slides off (two thumbscrews hold it on), and the interior is roomy and well organized. Cables and wires are for the most part neatly encased in black mesh and routed through rubber grommets in the walls, leaving the inside of the chassis free of mess. One small rat's nest of wires occupies the lowest empty 3.5-inch bay, but we'll overlook that. The Convoy's case has plenty of space for upgrades, including three open 5.25-inch bays and three empty 3.5-inch bays (though one of these bays is full of wires, so it's really more like two empty 3.5-inch bays). The machine also has a couple of open and accessible PCI slots (x1 and x16), and two open RAM slots. Installed as well is a liquid cooling system along with three fans, two of which are located in the front of the computer and illuminated by the white light. The fans are somewhat loud, but that's to be expected on a gaming machine. The V3 Convoy isn't the best gaming machine out there--at the moment, that title remains with the Maingear Shift Super Stock--but it comes pretty darn close. Next to the superstar Shift Super Stock, the V3 Convoy can hold its own: Its WorldBench 7 score is within 15 points of the Super Stock's, and its graphics performance is pretty good at non-maximum-quality settings. Plus, the cost of the Convoy is a mere fraction of the Super Stock's hefty $8000 price tag. 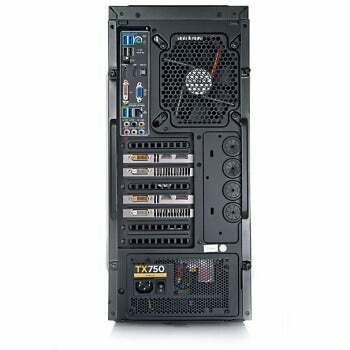 The Convoy also has a large, organized chassis, which means you can take the money you'll save by not buying the Super Stock and invest in another hard drive, a couple of SSDs, or another graphics card. Maybe you can afford to invest in all of those, since you will be saving about $5500. The V3 Convoy performs on a par with the Maingear Shift Super Stock, but for a fraction of the price.